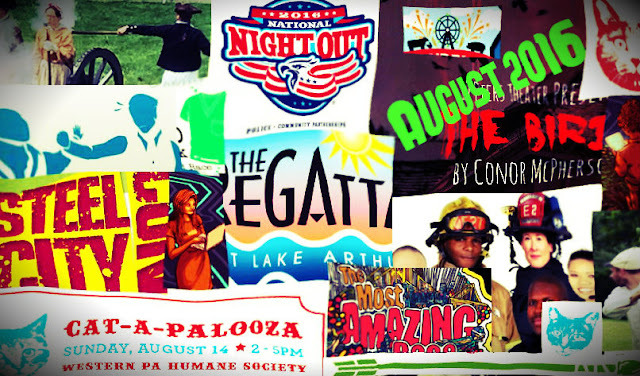 Top Pittsburgh Events for August 2016 include a National Night Out, Steel City Con, Yinzer 5K, Lake Arthur Regatta, Cat-a-palooza and Cannons! Check out these featured 2016 August Events. Daphne du Maurier’s short story, also the basis for Alfred Hitchcock’s classic film, is boldly adapted by Conor McPherson—a gripping, unsettling, and moving look at human relationships in the face of societal collapse.. The Kids Triathlon started out as a fundraiser for Habitat for Humanity of Greater Pittsburgh but has become so much more than that over the past sixteen years. While it remains Habitat’s major fundraising effort to raise money to build houses for people in need of affordable, decent housing, it also gives kids a fun and energy-burning activity in the summertime! Athletes of all abilities are encouraged to participate. Registration starts at 8 AM and our Pittsburgh themed race will start at 9 AM! Yinz' should join us! Food. Music. Art. Three forces that have transformed Pittsburgh into a nationally recognized hot spot for culture and entertainment. FEASTival celebrates these three elements in a daylong FREE summer festival. The 5th annual Horror Fan Flea Market. A way for horror fans to clean out their stash of movies, books, posters, figures, etc. and make sure they find a loving home with other horror fans! And now we are adding arts, crafts and other handmade items. Wigle Whiskey & Woodville Plantation join forces to bring you a night of whiskey and history! Enjoy dinner & whiskey cocktails and tastings. Food and beverages from around the ‘burgh, live music and a night out with friends! Tickets are $30! Join Soergels for a celebration of slow food and reconnect with the land during our annual sunset dinner in the apple orchard. Spend an evening with our family on the land where your food is grown as we share a behind-the-scenes look at one of our farms. Fun cat themed activities including: adoptable cats & kittens, fantastic feline themed activities, vendors, Ask the Cat Expert, guest appearances, amazing raffle items, bake sale, and so much more! This year we are bringing back some favorite events like the Rodeo and Demolition Derby as well as All Your Classic Favorites like Rides & Games, Great Food and Exhibits. We are providing great opportunities for Livestock Breeders, Agricultural Exhibitors, Homemakers and 4-H and FFA members to display to the public their products, crafts, clothing, baked goods and animals. Most Delicious Time of Year. Join us for a family friendly 8k or 4k Run/Walk. Runners, walkers, wheelchair participants, strollers, and pets are welcome! A family friendly Day of Events at the Barry Schell Field on Center Ave.
Come join us for Pittsburgh's city-wide challenge race! Teams of two will travel around the city completing challenges and collecting clues. Abstractions is a new conference that brings together everyone involved in modern software development — designers, developers, DevOps, and community leaders — to teach, learn, and connect. See what artillerists at Fort Pitt needed to do before they could fire a cannon. Artisans such as tinners, turners, and blacksmiths will demonstrate and discuss how their trades contributed to cannon firings. Cheer for a game of baseball, 19th century style. Come watch a “base ball” (originally written as two words) game between the Somerset Frosty Sons of Thunder and the Addison Mountain Stars, who will wear vintage uniforms and follow the rules commonly used during the 1860s. Enjoy food and fun in the 19th century American tradition. 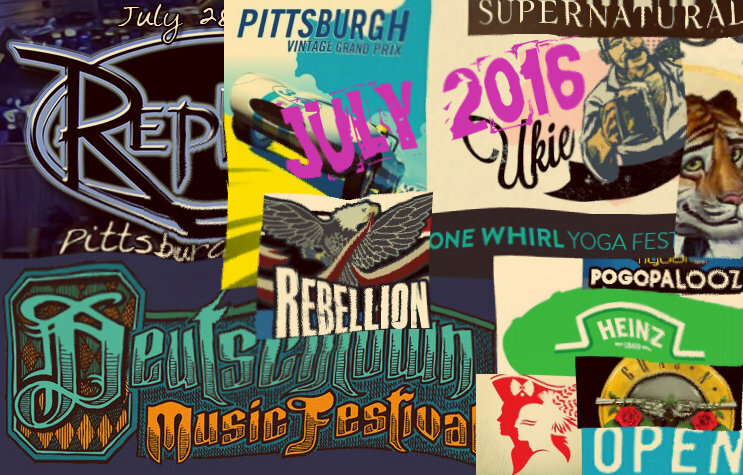 Top Pittsburgh Events for July 2016 include a Whiskey Rebellion, Extreme Pogo, Vintage Grand Prix, Deutschtown Music Festival and much more! Check out these featured 2016 July Events. 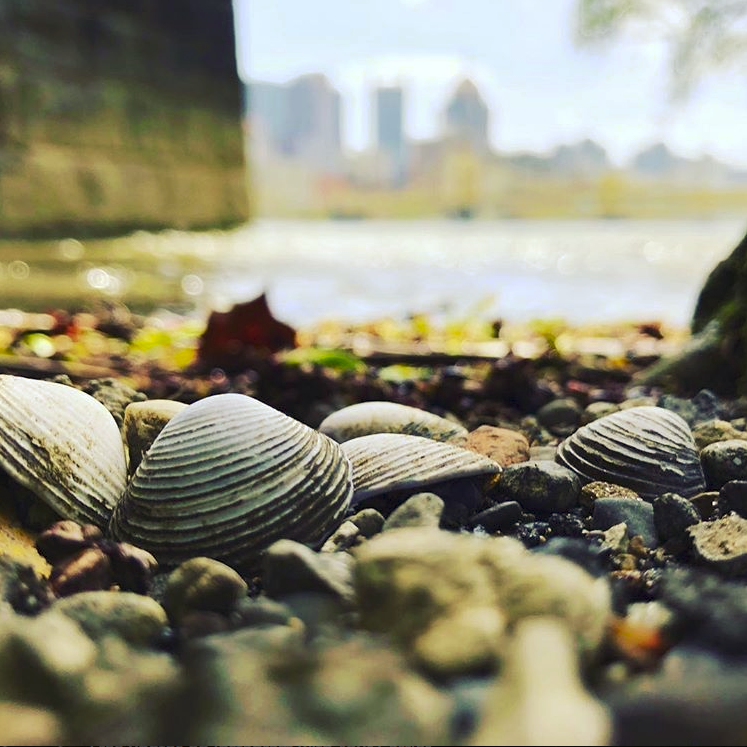 The Whiskey Rebellion Festival celebrates the heritage and unique character of the region by focusing on the historical significance of the Whiskey Rebellion, a history that is unique to western Pennsylvania and primarily Washington County. At the beautiful, apocalyptic setting of Carrie Furnaces in Swissvale, PA. You will too. The event is centered around the best Pogo Park ever constructed, and the top handful of Riders from around the world will battle it out in three competitions. Downtown Pittsburgh transforms into Picklesburgh, highlighted by a giant flying Heinz pickle balloon, custom built by a team that also crafts balloons for Disney and the Macy’s Thanksgiving Day parade. The Picklesburgh festival is a culinary celebration that goes beyond the dill pickle to include international dishes, prepared foods and artisan cocktails that feature pickled ingredients; an embrace of the farm-to-table movement and the rising popularity of canning; a selection of handcrafted foods and artisan cocktails from local restaurants; informative how-to demos and author talks at our demo area; merchandise such as pickled goods, books and DIY products. The Saint Sebastian Parish Festival and Flea Market is one of the largest and most widely attended church festivals in the Diocese of Pittsburgh. Each year, it attracts approximately 1,500 people per night and raises more funds for Saint Sebastian School and Parish than any other fundraising activity. The Festival is fun for all ages, with rides for both children and adults, games, outdoor festival foods and seated dinners, bingo, a basket auction and much, much more! 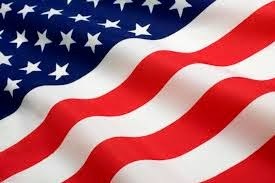 Celebrating America's Longest Running Genre Series. The Pittsburgh Vintage Grand Prix’s mission is to produce a world-class vintage racing event in order to raise funds to help provide residential care, treatment and support for developmentally disabled individuals in the Pittsburgh region. Deutschtown Music Festival is a free community music and arts festival. Over 125 bands will perform to upwards of 10,000 people in over 15 venues and 4 outdoor stages - all within walking distance of the East Ohio Street business district. The event features family-friendly activities and a stage in a city park and a two-block closed city street that will feature numerous food trucks and vendors. Have a blast in downtown New Castle! On July 9, 1816 Pittsburgh’s first Mayor, Ebenezer Denny, took office. To commemorate this occurrence, Mayor Peduto is planning a parade and celebration to be held on Saturday, July 9 starting at 1 p.m. on Liberty Avenue at 11th Street, downtown. Slovenefest, a three-day event held the second weekend of July at the SNPJ Recreation Center in the Borough of SNPJ, PA, brings together thousands to enjoy the ethnic food, music, culture and fun of Slovenia. Bushy Run Battlefield is once again opening its parking lot to classic and custom cars, trucks, or modified vehicles. Enjoy classic cars, live music with DJ Glenn Raymer, food and drink, 50/50 raffle, and more! The festival offers traditional Ukrainian foods such as pierogies, kobasi, halubtsi, and more to the public. What if you could close down a city street, and use it for a few hours of good, healthy, family fun? Live art and music, creative food and beverages at The Mon Wharf!